All your hard work and determination have paid off, and you’re about to embark on the next phase of your life. We encourage you to attend all of your graduation ceremonies to celebrate your remarkable accomplishments with family and friends. We’ve included all the relevant information about commencement and convocation to make sure you’re prepared. 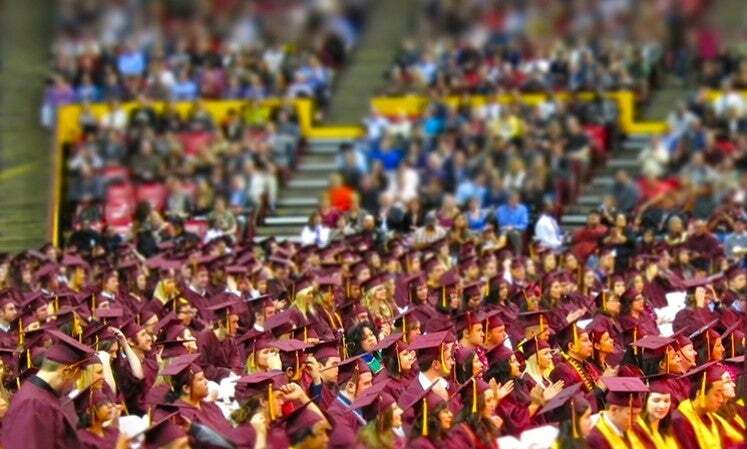 University Commencement – A ceremony where Dr. Crow confers degrees upon all graduates. The College of Liberal Arts and Sciences Convocation – The ceremony during which all graduate names within the college are announced as they walk across the stage and receive their diploma cover. As you transition from student to alum, we urge you to take advantage of the continued support and guidance available from your alma mater – we’re here to help you succeed in all your ventures. The spring College of Liberal Arts and Sciences Convocation is split into two ceremonies to ensure all of our graduates and their guests can safely fit into Wells Fargo Arena. We determine the splits based on the number of graduates in each of our academic units and try to make the two ceremonies as even as possible. Below is a breakdown of which schools and departments will be represented in each of the ceremonies.